Shri Jagannatha Temple is located near Kidderpore Tram Depot within the compound of East Yard Kolkata Port Trust. 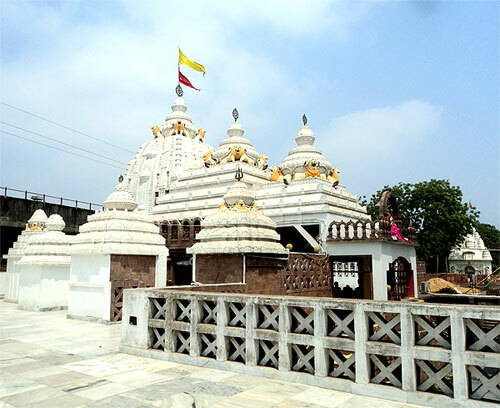 The present temple built in style of Puri temple is the result of years of hard work and financial assistance of many devotees. Mahaprabhu Shri Jagannatha, Shri Balabhadra, Devi Shubhdra and Sudarshan Chakra are worshipped daily keeping with the tradition and rituals observed at Puri. Various Puja-Parvana associated with the Lords are also observed round the year. Devotees who come to the shrine get Mahaprasad in the temple and can also take home for their friends and relatives. The Holy Ratha Yatra or Car Festival of Mahaprabhu is celebrated every year amidst much fanfare. People who reside in the city of Kolkata and the suburbs come in hordes to have darshan of the Lord in Chariot. 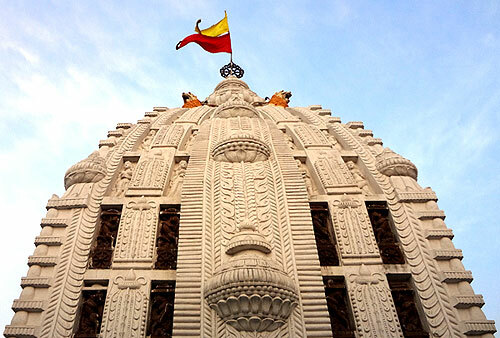 This sacred place has come to be popularly known as Srikhetra or Jagannath Dham of Kolkata. Important information regarding Jagannatha Dham (Kolkata) has been furnished below for all devotees. With generous help of numerous devotees a small temple was constructed on 23rd January 1969. Gradually, the place also developed as a centre of Jagannath Culture with many Seminars and Workshops organized in the temple premises. Distinguished literati from Kolkata and other parts of the country participated in such programs. Over the years a bigger temple was built and in 2003 new idols were installed with eminent pundits from Puri chanting Veda and performing the required rituals and Yagnya. As in Shri Jagannatha Temple Puri, there is Aruna Stambha at Singhadwara. As we begin moving from the Aruna Stambha and climb the flight of eighteen stairs, we come across Garuda Stambha in front of the main temple. There are another four stairs which completes the twenty two steps to arrive at the Ratna Bedi resplendent with the divine idols of Shri Jagannatha, Shri Balabhadra, Devi Shubhadra and Sudarshan Chakra. Walking clockwise around the main temple we come across exquisitely sculptured smaller temples of Shri Ganesha, Ma Saraswati, Mahavir Hanuman, Surya Narayana, Ma Bimala, Ma Lakshmi, Bhagawat Tungi and Lord Shiva at the end. Apart from these temples we also find Yagna Mandap, Snan Bedi, Koili Baikuntha and Bata Mangala Temple within the Temple premises. There are other places like the temple kitchen to cook the Mahaprasad, Anandabazar where Mahaprasad is served to the devotees and a shop selling puja materials. All the important Puja-Parvana observed at Puri Jagannatha Temple are also carried out at Kidderpore Shri Jagannatha Temple. The important ones are : Snan Purnima, Ratha Yatra (Gundicha Yatra), Jhulan Yatra, Balabhadra Jayanti( Rakhi Purnima), Shri Krishna Janmashtami, Ganesh Puja and Shrimad Bhagavat Jayanti in Bhadra, Durga Puja and Lakshmi Puja in Ashwin, Bhagawat Saptaha and Rash Purnima in Kartika, Saraswati Puja in Magha and Shivaratri and Dol Purnima in Falguna, Ram Navami in Chaitra are observed with great fervor and enthusiasm. At devotees' request personalized Pujas like Satyanarayan Puja, Rudrabhishek, Naamkaran Utshab, Thread Ceremony and Marriages etc are also organized. Morning : 6 am to 1 pm, Afternoon : 4pm to 9pm Sandhya Arati : every day at the time of sunset. Bhog is offered twice daily at 12:30 PM and at 8:30 pm. The temple administration looked after by Jagannath Seva Samiti, is supported by following units looking after social and cultural activities. Utkala : for Cultural Work, Utkarsha : for Social Welfare Work, Sri Jagannath Pathagar : for promoting Jagannath Culture and Literary Work. A person can apply for life membership by filling up the membership form and depositing the corresponding fee at the office. For every life member special puja and "homa" are performed on the chosen day and two Mahaprasads are available free. Devotees may contact office for details.